Fraser Forster and Southampton had a night to forget as they were soundly beaten by Tottenham. 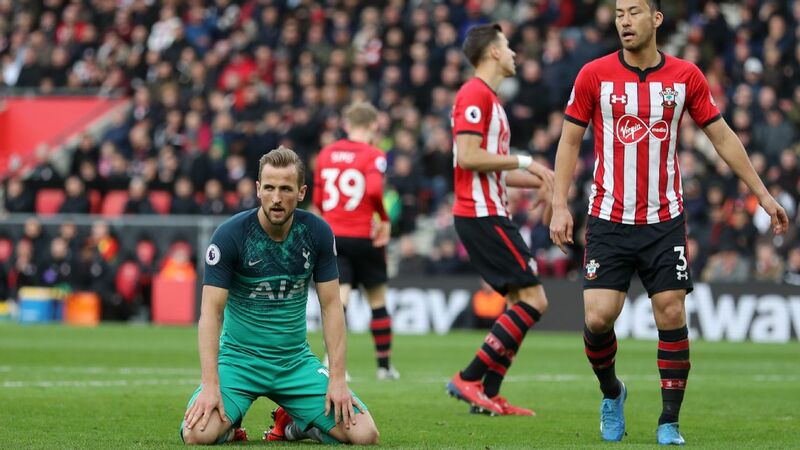 Southampton slumped to their heaviest home defeat of the season as Tottenham fought back from 1-0 down to win 4-1 on Mauricio Pochettino's return to St Mary's on Wednesday. Saints got off to a flier after Virgil van Dijk headed them in front after only 69 seconds. But a double from Dele Alli and goals from Harry Kane and substitute Son Heung-Min saw Spurs ease to victory. The defeat would have been even worse but for Kane's penalty howler after Nathan Redmond had been sent off for bringing down man of the match Alli. Southampton were brilliant for 15 minutes and showed they could mix it with the Premier League elite. At least Kane's penalty miss saved them the embarrassment of conceding five at home. Despite having a break of 10 days between their last game, Southampton badly ran out of steam after Alli's 19th minute equaliser. Fraser Forster's worrying lack of form is now a major concern for manager Claude Puel. Van Dijk also had a poor game, suggesting the rumours over his future are beginning to unsettle the big Dutchman. Saints have now scored just nine goals in nine Premier League home games. 5 -- Puel tried to play Pochettino at his own game by asking his players to press high but they did not have the energy levels to maintain this beyond the opening quarter of the match. His triple attacking substitution at 2-1 down left Southampton vulnerable on the counterattack and this was ruthlessly exposed by a rampant Spurs. GK Fraser Forster, 3 -- His distribution was nothing short of appalling and he could have done better with at least two of the four goals. DF Cedric Soars, 3 -- Second best to Moussa Sissoko and wasteful when he got himself in good attacking positions. DF Jose Fonte, 5 -- Recalled to the starting lineup after being dropped for the south coast derby win over Bournemouth, but looked like he'd rather be somewhere else. DF Virgil van Dijk, 5 -- Made a brilliant start by scoring an early goal but then mistakes began to creep in. His worst display of the season. DF Ryan Bertrand, 5 -- Made no impact going forward and not at his best defensively either. MF Oriol Romeu, 4 -- Back after suspension but game passed him by as Tottenham dominated in midfield. MF James Ward-Prowse, 6 -- Southampton's biggest threat with his set piece delivery and played in a great ball for Van Dijk's goal. MF Steven Davis, 6 -- Had a storming opening 20 minutes when Tottenham were on top but faded badly after that, along with his teammates. No.10 Sofiane Boufal, 5 -- Some flashes of genius but also played his team into trouble at times. FW Jay Rodriguez, 5 -- Looked like a man possessed early on, but barring one flashed shot across the face of goal he never looked like scoring. FW Nathan Redmond, 5 -- Sending off appeared a little harsh but got himself on the wrong side of Alli before bundling him over in the penalty area. MF Pierre-Emile Hojbjerg, 4 -- A passenger. No. 10 Dusan Tadic, 4 -- Made absolutely no impact. FW Shane Long, 5 -- Provided a good outlet but Southampton were firmly on the back foot by the time he got on.